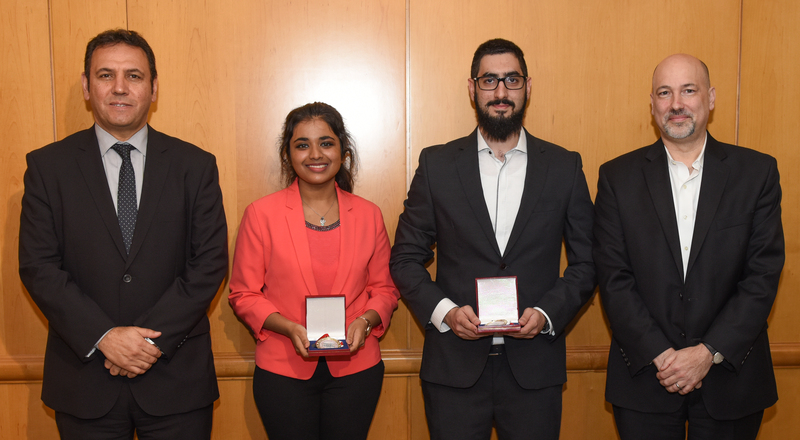 American University of Sharjah (AUS) celebrated the achievement of its top graduate students for the academic year 2017—18 at the University Awards for Excellence in Graduate Studies held on campus, yesterday, May 14. The awards recognize a student’s outstanding contribution to research, scholarly and creative work at the university and their contribution to the advancement of knowledge in their field. They also encourage a culture of excellence within the graduate student body as well as to promote the achievements of graduate students. The Graduate Student Research, Scholarly, and Creative Work Excellence Award was presented to Ragini Gupta, a student in the Master of Science in Computer Engineering program. The award recognizes the outstanding contribution to research, scholarly and creative work at the university and their contribution to the advancement of knowledge in their field. The Graduate Student Academic and Leadership Excellence Award was awarded to Haidar Alhaidary, a student in the Master of Science in Civil Engineering program. The award recognizes overall performance as indicated by academic accomplishment and leadership as demonstrated through contributions to the program, university, community and/or profession.